If you live in a small home like a studio apartment, you may not have the space for a separate bedroom. Even if your home is larger and has an extra room, you may want to use that room for multiple purposes, say as an office as well as the guest bedroom. Given that a comfortable full or queen size bed takes up a large amount of space, if the room in question is small, once you put a conventional bed in it, you may not have room for much else. ​You might of course want to use a pull-out sofa bed or a futon, but clearly these are not very comfortable or style-wise sophisticated options. These can not in general accommodate thick mattresses, and often one feels the supporting frame and metal bars when lying. A cabinet bed is a stand alone portable piece of furniture that can hide a full size bed. The bed folds three times so it can fit in the cabinet. A wall bed (also known as Murphy bed) is a bed that is hinged at one end, to store vertically against the wall, or inside a closet. This article will compare cabinet beds with wall beds (Murphy beds). It will compare in particular the Arason Creden-ZzZ cabinet beds and Bestar Versatile wall beds which were the most popular in their category and the best rated among Amazon customers at the time this article was written. Requires Less Space: A cabinet bed fits into a small furniture that looks like a buffet or a sideboard. It is equipped with a door that pulls out like a drawer, and the frame of the bed expands together with the mattress which is folded up inside. Cabinet beds can even fit in rooms with low ceilings. Easier to Install: Wall (Murphy) beds require installation. You will usually need to drill into your wall's studs in order to attach the bed’s frame. Cabinet beds require no installation whatsoever because the entire unit is self-contained. ​Portable: Unlike wall (Murphy) beds which must be permanently fixed to the wall, cabinet beds can be moved easily from one room to another since they are self-contained and not attached to the wall or the floor. ​Usable Folded State: When the bed is hidden, you can use the cabinet as a TV stand, side table or for some other purpose. No Need to Remove Bedding: With a Murphy bed, you can leave your bedding and sheets on the mattress when it folds up, where as with a cabinet bed, in general, you will have to remove the sheets and bedding when folding away the bed each time. But usually, the cabinet bad is equipped with a large drawer where you can store the bedding. Does not Require a Pre-Made Mattress: Because the mattress of the cabinet bed will need to fold three times before it can be stored away in the cabinet, a specially adapted pre-made mattress is required. That is why the mattress is always included in the purchase. A wall bed does not require a pre-made mattress as it does not need to be folded. 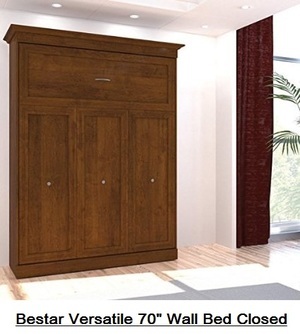 While pre-made mattresses that come with cabinet beds are usually quite comfortable, if you are a delicate sleeper who requires a specialized mattress this may not be the ideal solution. Provides Ample Extra Storage: Certain configurations come with plenty of floor-to-ceiling extra storage space in the form of shelves, closets and drawers on each side of the bed. 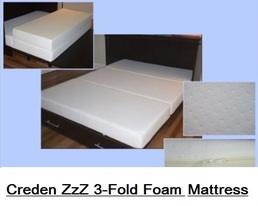 The 6" thick mattress is composed of a 4" layer of high density base foam topped with a 2" layer of memory foam. It is built in three segments that fold like an accordion to fit in the cabinet. The three segments are sewn together and do not separate when laid flat (see third picture below). It is a queen size mattress (60" x 80"). As shown in the second picture below, the flip-top is equipped with special hinges that keep it from folding all the way back. So, when you flip open the top, you can still leave the items on top by simply pushing them back to the rear. The flip-top provides sleepers with plenty of headroom while at the same time keeping a low, easy-to-use top surface. Note that latches and safety chain are hidden inside for a clean exterior. The cabinet bed opens to W64" x L83" x H39". When it is closed the front of the cabinet is 24 inches from the wall. It is free standing and does not require to be bolted to the floor or walls so that it can easily be moved from one room to another. ​The drawer is quite roomy and can be used for pillows or blankets when the bad is folded away. Arason Creden ZzZ cabinet beds are offered in a number of colors: Original Coffe, Pekoe and Mocha. 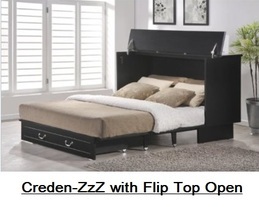 ​All Creden ZzZ cabinet beds can supports up to 500 pounds. There is a 1-year warranty on the cabinet bed as well as the mattress. 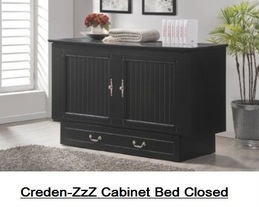 Creden-ZzZ Cabinet Beds on Amazon. It provides a good space saving solution for your house, condo, loft, studio or guests room. It accommodates a standard queen size mattress up to 12” thick and up to 100 lbs. Maximum dimensions of the mattress are (60" x 80"). Note that the mattress is not included. ​The assembled dimensions of the bed and frame are (W69.4" x D22.6" x H89.9"). The assembled overall weight is 364 lbs. There is a 10-year warranty. These wall beds come both in Tuscany brown and white colors. Both colors are offered in the Amazon section below. It provides a good space saving solution for your house, condo, loft, studio or guests room while providing additional storage space. ​​It includes not just the queen wall bed, but also a 25" storage unit. All surfaces feature durable scratch, stain and burn resistant melamine finish with attractive crown molding. Each unit of this collection will help you organize your storage needs perfectly. It accommodates a standard queen mattress up to 12" thick and up to 100 lbs. Maximum dimensions of the mattress are (60" x 80"). The assembled dimensions of the bed are (W69.4" x D22.6" x H89.9"). The assembled dimensions of the storage unit are (W25" x D20" x H85"). 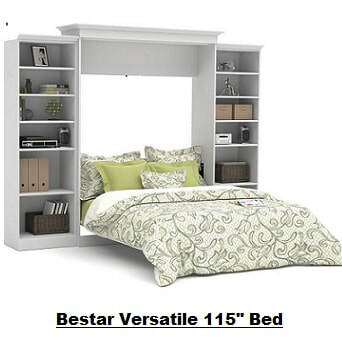 The overall dimensions (bed + storage unit) when assembled are (W114.8" x D22.6" x H89.9"). The assembled overall weight is 654 lbs. These wall beds come in either White or Brown colors. 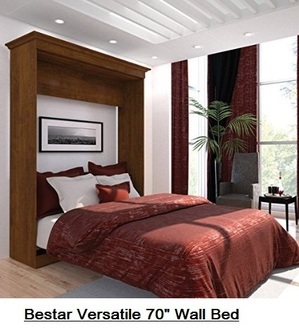 Bestar Wall Beds on Amazon. So which to get? A Cabinet Bed or a Wall Bed? if the room has a lower ceiling or does not have enough wall space for a wall bed. if you're looking for a portable hidden bed and one that does not require to be fixed to the floor or the wall. if you want a hidden bed that requires practically no installation. if you want to use the hidden bed unit for a TV stand or to display other stuff when the bed is hidden. if you want to be able to choose the type and exact size of your mattress. Note that a cabinet bed must have a pre-made folding mattress and it comes with the cabinet bed. Though the mattress that comes with a cabinet bed is usually quite comfortable, this point may be an important consideration for people who must have a special type of mattress for health reasons. if you want to have additional storage space (shelves, drawers and closets) on each side of the bed (note that not all wall beds come with side storage). if you don't need to move your bed from one place to another. Wall beds require more involved installation and can not easily be moved from room to room. 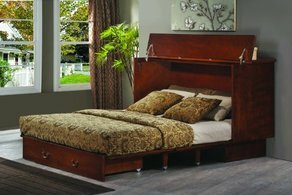 Please click the Arason Creden-ZzZ cabinet bed of your choice below for price information or to purchase. 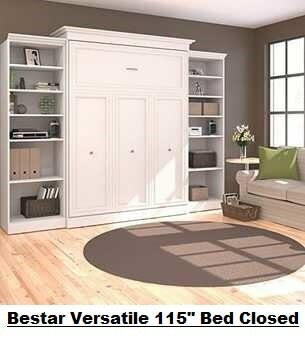 Please click the Bestar Wall (Murphy) bed of your choice below for price information or to purchase. Note that though the overall sizes of the wall beds shown below are either 70 or 115 inches, all four beds shown accommodate a queen size mattress.